Content marketing is one of the most popular topics in marketing today. But with everyone jumping on the bandwagon, what content is effective? Valuable? Lead generating? To that end, following are 7 Steps, Tips and Strategies for effective content marketing. We share with you a recent article by Social Media Today contributor Mark Learner about Content Marketing titled Top 7 Tips for Effective Content Marketing. Along with our own editorial and ideas for proper content marketing. Effective content marketing leaves the pitch to the salespeople. The minute you start talking about how great your product is, the reader sees right through this and closes the page. Give your readers information they want and need. Are you selling a cloud monitoring solution? Create a whitepaper explaining the hidden costs in underutilized instances. Are you promoting a lending solution for small businesses? Offer tips and tricks on cash flow management for small business owners. In today’s internet age, people turn to Google whenever a question arises. If a person is struggling with time management, sure he may ask colleagues for advice, but eventually he’ll end up on the computer searching for “Time Management Tips”. Figure out what your potential customers are searching for and help them solve that problem. Consistently offering objective information that solves or pre-empts your customer’s problems will ensure they come to you the next time an issue arises. Author Reaction: With the introduction and development of semantic search, the Question and Answer sessions in a content strategy will become even more important. Tie what people want to know to what you have to give, but don’t stretch beyond your scope. Hosting a blog on your website is the easiest and most effective method of boosting SEO, sharing your content, and ensuring that your site is live. Every time a new blog is added, the search engines scan your site and boost your ranking. Aim to publish a new blog at least 2-3 times a week. Post on the same days each week so your readers know to stop by on a certain day. Author Reaction: We love blogging. From Curation to unique content, we share our insight through our blog. Not only does it benefit SEO, it brings users to the information they want to know when they need it. Therefore, we actually offer a free subscription to our insight at the Modern Marketing Scoop. Being tasked with writing a whitepaper can be a daunting thought. What will you write about? What point are you trying to make? When will you find the time to make it happen? Here’s the beauty of content, it can be used for so many purposes. Combine a bunch of those wonderful blogs; add an intro, conclusion, and cover page and you’ve got a great and marketable whitepaper. Stick that whitepaper behind a registration form and you’re armed with a great tool for lead generation. Did you give a presentation at a meet up? Use the PowerPoint and your speech as the basis for a blog or slideshare. With an open mind and a little creative re-working, your content can easily be put to multiple uses. Author’s Reaction: Tied similarly to a Jeff Bullas blog, “Why You Should Steal Content,” employing a content strategy that includes Curation is a safe move to build your influence. Not only use your current content for SEO improvement, but also build your influence by using other’s content with proper attribution. Videos are all the rage right now and easier to produce than you might think. With a decent script, you can take advantage of online tools like Powtoon to create animated presentations that will catch your customer’s attention. Stick it on your homepage or share it on YouTube to let people know what you’re all about. Author’s Reaction: We’ve believed for years that the Infographic is the best way to share content to which people will respond, and are embracing our video strategy to drive interaction in content. Now that you’ve created all this wonderful content (blogs, whitepapers, videos, PPTs), you need to make sure the people, and search engines, can find it. Optimizing your content is easy and can really boost traffic to your site. Write a catchy title that will draw people in. Include Meta titles and descriptions featuring your keyword. Does your keyword appear in the title, Meta data, URL? There are wonderful tools and plugins available to assess your SEO. My personal favorite is Yoast, which ranks your content as well as tells you exactly what needs to be done to optimize your content. Author’s Reaction: As someone who uses Yoast as a primary means of validating my blogs with respect to SEO, I couldn’t agree more with the importance of ensuring proper Search Engine Optimization through tools provided. With an arsenal of optimized content, the next issue is how to make it work for you. Enter the world of social networking. Social media is one of the best ways to distribute your content. Networks such as Facebook, Twitter, LinkedIn, Google+…this is where your target audience is and the most effective way to reach them. Whether they admit it or not, most people can be found on some sort of social networking site throughout the workday. Why not make the 5-minute break a productive use of their time? Write little teasers for your content and share it with a link to get people reading, sharing, and enjoying your content. This will further your reputation as a thought leader and bring more traffic to your site. Author’s Reaction: Believing not only in the importance of properly using social media to promulgate, but the importance of scheduling as well; joining the ranks of elite Hootsuite users allows you to schedule tweets to maximize interaction and understand the analytics behind a proper social media strategy. How Are You Developing a Content Strategy? We love to hear your insight on developing a content strategy that opens the door for a brand story and conversational plan between company and user. Please share your ideas and success stories in the comment section below. Are you looking for advice on any of the things that are set to build a content strategy? Modern Marketing Partners, a Naperville Business to Business Marketing Agency, believes that a proper content strategy is imperative to aligning your marketing and sales team. 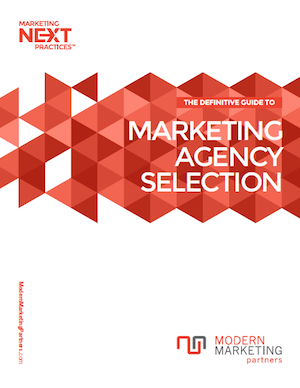 We offer services to clients and can provide you with a free Modern Marketing Report Card. Please Bookmark, Comment, and Share using the tools below.